Summer's on the way. You can almost smell the sun cream. To get in the mood, here are some of the best beach-based events across the globe. An exciting 5 day festival of open water swimming on the beautiful Caribbean island of Barbados. Swims will be from the Copa Cabana Beach in Carlisle Bay. There will also be Stand Up Paddle relay races, kayak relay races and rum-fuelled beach parties. Each June, runners take to the pristine sands of the famous Whitehaven Beach. A 7k stretch of crystal clear aqua waters and pristine silica sand, Whitehaven Beach was named the South Pacific's 'Best Beach' by the 2015 TripAdvisor. The Cape Town Cycle Tour is the largest timed cycling event in the World. It celebrates its 39th year in 2016, when 35,000 cyclists will line up in Cape Town's city centre to ride the 109k route through some of the World’s most spectacular scenery, with the iconic Table Mountain as a backdrop. This spectacular oceanfront run is a Southern California institution. Start by the famous Huntington Beach pier, run through the scenic Huntington Central Park and along the Pacific Coast Highway. These are the same beaches where the legends of surf movies and music were made. More than 2,000 volunteers and several surf bands will be along the way, cheering you on. Britain does of course have its own fair share of beautiful beaches. Although Battle on the Beach is only its third year, its already seen by some as THE bike race of the year. In spring a lively mix of mtb-ers, cyclocross riders and 'fat bike' specialist head to Pembrey Beach, South Wales to do battle with the beach, sand dunes and singletrack. 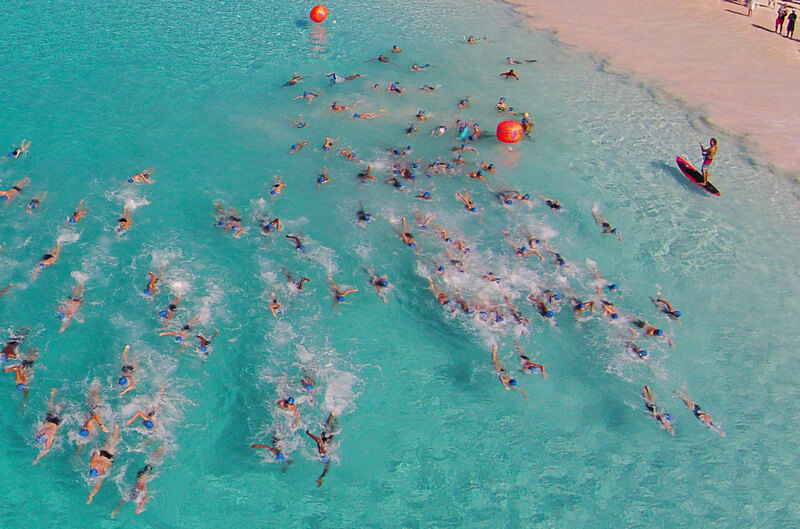 Known as one of the world's most exotic open water swims, the annual 'Race for the Conch' takes place in the clear turquoise waters of Grace Bay, Turks & Caicos. Top international swimmers compete alongside amateur swimmers for the conch trophy. The main event is a challenging 2.4 mile course, with shorter 1 and 1/2 mile options also available.